Like all people in love with culture, I consider Venice a high point. I have spent a lot of time just down the same coast. I speak Italian reasonably well, altho the Venetian dialect is actually impenetrable to me. I was last in Venice a couple of years ago with my kids. We saw a little of the biennale. Yes! We happened to be there on a rainy and therefore deserted summer evening. We took advantage of the opportunity to take a gondola ride minus the usual crowds. It was very dark, very quiet, and quite grim. We saw rats down an alley tearing at the garbage. It was a rare moment that allowed us to get a glimpse of pre-20th century Venice, and proved to be very useful visual background for novels about historical Venice. 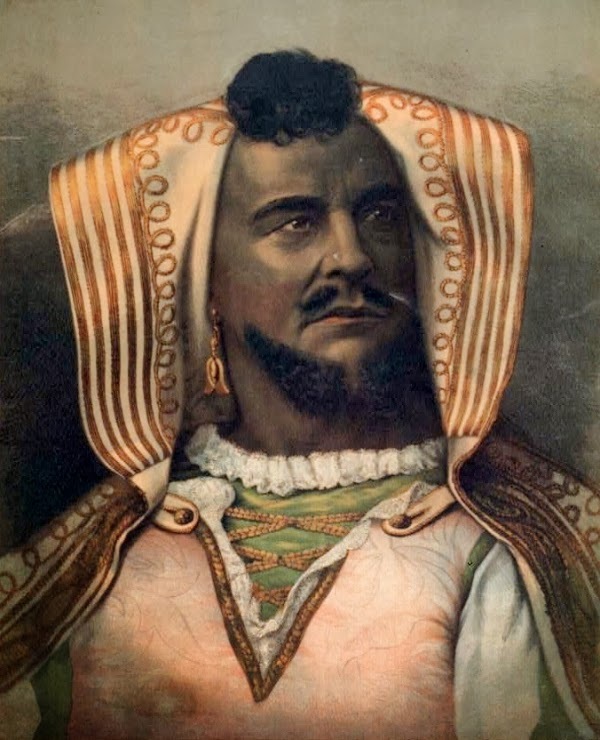 This year one of my kids studied Othello, really The Tragedy of Othello, the Moor of Venice. John Edward McCullough plays Othello, 1878. Lithograph by Forbes Co., Boston & N.Y. Public domain. It was the perfect moment to get out a birthday gift, Iago by David Snodin, and start reading it. Then in an accident of timing I also found myself reading, for a LibraryThing early review, Scherzo: a Venetian Entertainment by Jim Williams. Of course one should expect to encounter the same family names in books involving Venetian aristocrats, especially in Council of Ten characters, which is happening even tho these stories are set about a century apart, and provides a kind of shivery historical depth to the characters in both. But beyond the similarities in the setting and glimpses at the source language and culture there are additional elements in common between the two books. And maybe something about Venice is…fractal?…in a way that led both writers to choose an epistolary narrative style with multiple voices. I'll start with Iago, because I had chosen it for myself at the bookstore, and I started reading it first. So, Snodin is a respected producer of Shakespeare and Dickens and Austen for the BBC with a big attractive hardcover offering, but I found the book slightly...wrong. I can't help mentioning that it is LARDED with Italian, practically every instance of dialogue has an Italian word or phrase inserted, many of them fairly obscure, and altho I had to look up a few to verify their accuracy, I found few errors. Very scholarly. On the other hand, THE PLACE NAMES ARE ALL IN ENGLISH. What? Wouldn’t that have been the first step in bringing English-language readers into Italy? Harold Bloom begins his essay on Othello in Shakeshpeare, The Invention of the Human, by showing why in the 20th century Iago's story has eclipsed the "Tragegy of Othello". Snodin gets that, and loves Iago as a character. He wrote a little piece in the Huffington Post called The Best Villain Ever about his inspiration. The funnest thing in the article is that if it wouldn’t typecast him (hmmm - there’s a pun there…) he would love to do a similar extension on Edmund and Goneril from King Lear. The hint that would take him away on a Goneril journey is jaw-dropping. Actually! I would love to read it! The book moves ploddingly, but is not uninteresting. I kept reading it, but boy! is it a little too long and repetitive. The opposite of what I would expect from a TV background, but I suspect Snodin wanted to make his erudition clear. Side note on tech: it was a great advantage to read Scherzo as an ebook. I could highlight and make marginal notes, but instead of having to search by rifling thru pages, in an ebook (I use the Kindle app across a number of devices) you can tap a button and see all your highlights and notes in a lovely list. There is also a way to save your notes to Evernote, where they could be filed and tagged usefully. I still have to actually implement it, but I have gotten as far as looking up the instructions. I have no general theory about writing murder mysteries, but however one divides the genre, there seem to be three possible foci for the narrative. The first is the identification of the murderer along with resolution of ancillary mysteries such as the exact method, place and timing of the murder. The second is the process of detection itself, whether through exploration of the character of the detective, or police procedures and forensic science. The third is the background leading to the murder, which means an investigation of the psychology of the murderer or the dynamics of a set of relationships that will lead to the murder. These three approaches aren't mutually exclusive, but any novel will tend to emphasize one of them. …we can evaluate the works in two different ways: a) by the way in which they fulfill or fail to fulfill the full artistic effect of that particular type of construction… [and]…b) the way in which the individual work deviates from the flat standard of the genre to accomplish some unique individual expression or effect. This is the way snobby elitist readers, such as I, read genre fiction: looking for genre thrills rather than literature. With these two books we are actually in genre-mash-up territory–historical/foreign/mysteries. Scherzo succeeds wildly. Iago was fine. A lover of Venice or mysteries could enjoy either book. A lover of reading and writing would really enjoy Scherzo. This book is credited in the bibliography of Iago, and it is wonderful and while not actually about Othello, is about the empire that employed him as governor of Crete. An investigation into the fire that destroyed Venice's famous La Fenice theatre and the (corrupt) rebuilding process. Very very readable. Accords with what I know about managing things in Italy. Berendt also wrote Midnight in the Garden of Good and Evil. Henry James wrote about and lived in Venice for some time. So did Ezra Pound. Ezra Pound's mistress, Olga Rudge discovered and publicized hundreds (!) of Vivaldi concertos which had either been lost or forgotten, and she and Pound were the advocates of his music in Venice that reestablished his fame. Jane Turner Rylands is married to the director of the Guggenheim in Venice, and has written contemporary short stories about the city. Finally, I really enjoyed Carnevale by MR Lovric and A Venetian Affair by Andrea di Robilant. Cornelia Funke set The Thief Lord in Venice and Donna Leon has a famous (so-so) series of detective stories set in Venice. Finally, sadly not yet translated into English, is Tiziano Scarpa's Strega prize-winning Stabat Mater about Vivaldi and the Conservatorio dell'Ospedale della Pietà, a girls' orphanage. So tragically beautiful, just like Venice itself.